Healers Booties are designed for protection and healing. The Healers boot provides air flow and moisture wicking properties, decreasing the opportunity for infections and shortening recovery time for injuries to the animal. Healers are manufactured with a High Tech medical grade material that is used in the human market for healing wraps. Its outer surface is loop fabric so the hook can attach anywhere. 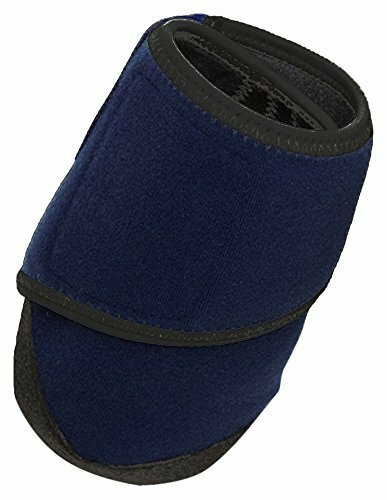 This provides pet owners the ability to get a snug, secure, fit as they wrap the boot around the paw. The Velcro Hook applied is low profile, high tensile strength hook that enables a strong hold, keeping the boot in its place. Healer's uses the highest quality components available and are made in the USA. They are recommended and used by Veterinarians. Our boots are made to last and are machine washable. Healers Gauze Inserts are designed to fit right inside the boot turning the boot into a non-adhesive bandage. The gauze pads will not stick to the wound while it heals and it has adhesive on the back side so you can place it where you need it. Healers Boots are comfortable, they provide traction on hardwood floors and the synthetic leather sole are perfect for light outdoor use. Best of all they are a bandage that is easy to use and make dressing changes a snap. Healers booties are sold as individual units or in a box set with 2 boots and 2 gauze inserts. They come in 5 sizes from extra small to extra large. Healers Gauze pads can be purchased separately. If you need added protection, check out Healers Leg Wraps. The leg wraps will connect to the boots extending the boot up the leg.To best size your pet print sizing chart. Draw your pets paws on paper, measure the widest point and choose the closest size. To size properly have pet stand on paper and draw around paw. Measure the paw width and choose the appropriate size. View More In Boots & Paw Protectors. If you have any questions about this product by Healers, contact us by completing and submitting the form below. If you are looking for a specif part number, please include it with your message.